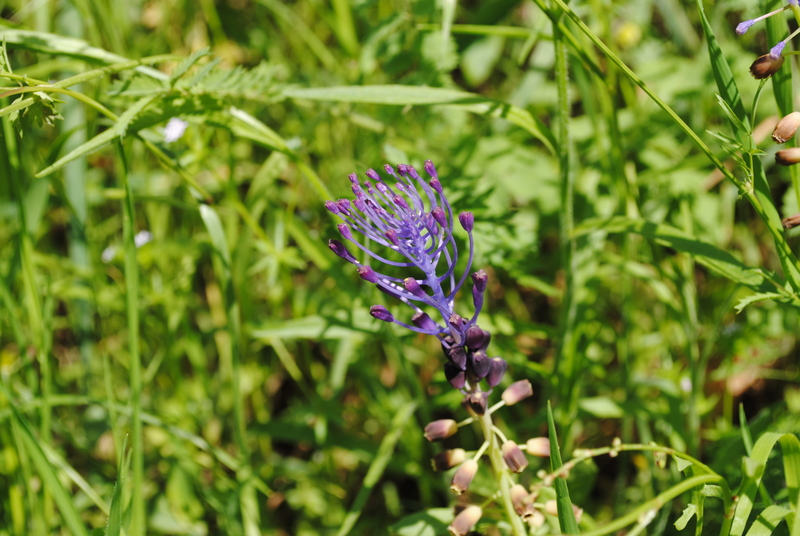 This alien-looking flower is a tassel hyacinth (Muscari comosum), a common wildflower in Italy. The plants grow to about 30cm tall and have striking tufts of upright violet flowers. 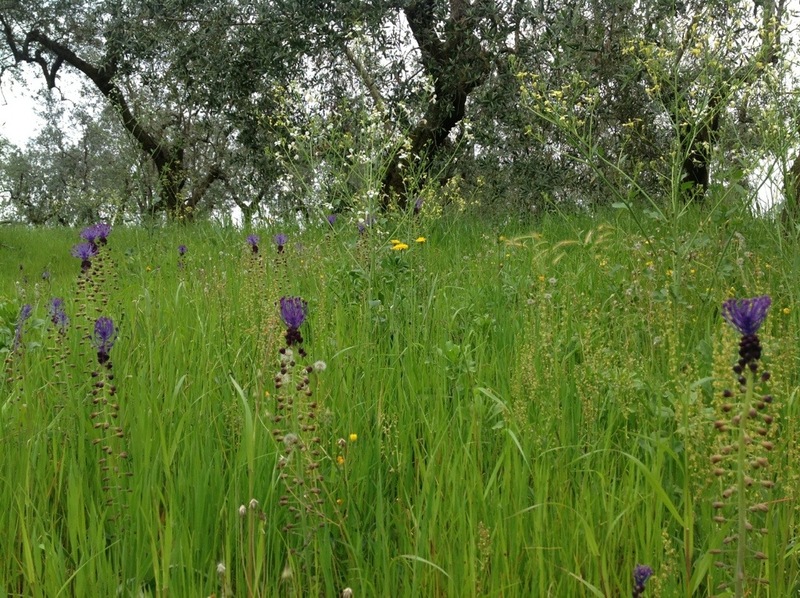 Tassel hyacinths are currently growing abundantly in our olive grove. Tassel hyacinth bulbs are edible and are known as lampascioni, although they are also referred to as cipollini (little onions). The bulbs look similar to shallots and have a bittersweet flavour. They are particularly popular in Puglia, where they are considered a local delicacy, and were eaten by the ancient Greeks and Romans, who attributed to them both stomach settling and aphrodisiac qualities. Lampascioni demonstrate the creativity of cucina povera – they can be sourced for free, but require long and elaborate preparation to transform them into something delicious. Once the bulbs have been thoroughly cleaned of soil they need to be peeled (this is apparently an unpleasant task as the bulbs ooze a sticky goo), then soaked in water for several days to remove their bitter flavour (the water should be changed regularly). The bulbs are then boiled in vinegar / vinegar and water until soft. They can be used in cooking but are often preserved sott’olio and served as an antipasto. Apparently they should be harvested in late winter/early spring, when the first leaves appear. Since ours are already blooming it’s too late to dig them up, but next year we’ll be looking out for their first shoots. What beautiful plant. Thanks for sharing! Thanks for visiting! They are very distinctive plants with such a strong colour, so they really stand out among the other smaller and more delicate wildflowers. I am always amazed at the resourcefulness of the generations of people who, before us, forged the land and found that the simplest of things found can be a delight in flavor, nutrition and taste. Those of us, particularly in the more urban modern society known as city life, take food for face value and simply pluck it off a grocery store shelf. Oh to the joy of taking and giving back to and from the land of the bounty God has to offer—all it takes is a little knowledge, a bit of patience… giving way to a self satisfaction of contentment. Absolutely! I think it’s so important that we don’t lose that knowledge in our convenience culture… Knowing exactly where your food is from and labouring to cultivate or find and then prepare it may take more effort than a trip to the supermarket, but it’s so much more satisfying ( both in terms of the process and the end result). Me neither. We had a few grape hyacinths growing in the grove but they weren’t identified to me as ‘onions’ like the tassel hyacinths were… They’re not in my British foraging books either. I would be interested to know if they are edible as well! We have them growing wild all around Bagni di Lucca. Thanks for the information, but I think I will just let them grow and look pretty. They are so beautiful and unusual that I agree at least some of them should be left to flower! Great post. I’ve learnt something new today! Thank you! I am constantly learning from the people around me – the blog is just passing that on. Michele’s parents are very good foragers – if something is edible, they will know about it! I’ve never heard of tassel hyacinths but I’m glad you’ll get to enjoy them, both visually and as food. Buon appetito. What a cool looking plant! Wow! They are bizarre looking but i think they’re beautiful nonetheless. Absolutely fascinating. After all that preparation I hope it is worth eating, personally I think I’d rather enjoy the flowers. I might give it a go next year but it does seem an awful lot of work!